We left Florence for Bologna by train at 7.50 a.m. As we were about to enter a railway carriage, a pleasant-looking English lady looked out and cried to us deterringiy, ‘This is not a smoking carriage.’ ‘Thank you, madam,’ I replied; ‘that is just what we want.’ So, as the two parties filled the compartment, we were not troubled with any selfish smoker, and, as we were all English, with no needless exclusion of the views by lowering the blinds. We reached Bologna at noon. The railway passes through many tunnels, and in some places at a great elevation. The views from it are fine. [Bologna] itself is dull, and the shops entering from the arcades are dark and second-rate. Photographs of Bologna can be procured at Florence, and perhaps in some as yet undiscovered region in Bologna itself. The Hotel Brun (the principal one) is an old-fashioned house. Like many of the Italian hotels, the salons are entered direct from the court-yard. There is still a Pazzi fund towards the expenses, but a few years ago the city became responsible for the whole proceedings, and the ceremony as it is now given, under civic management, known as the Scoppio del Carro, is that which I saw on Holy Saturday last and am about to describe. First, however, let me state what had happened before the proceedings opened in the Piazza del Duomo. At six o’clock mass began at SS. Apostoli, lasting for more than two hours. At its close the celebrant was handed a plate on which were the sacred flints, and these he struck with a steel in view of the congregation, thus igniting a taper. The candle, in an ancient copper porta fuoco surmounted by a dove, was then lighted, and the procession of priests started off for the cathedral with their precious flame, escorted by a civic guard and various standard bearers. 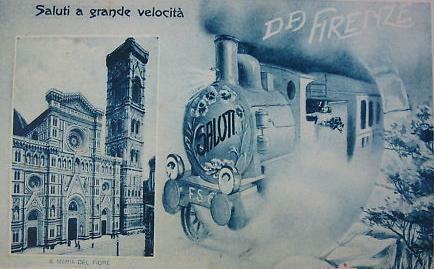 Their route was the Piazza del Limbo, along the Borgo SS. Apostoli to the Via Por S. Maria and through the Vacchereccia to the Piazza della Signoria, the Via Condotta, the Via del Proconsolo, to the Duomo, through whose central doors they passed, depositing the sacred burden at the high altar. I should add that anyone on the route in charge of a street shrine had the right to stop the procession in order to take a light from it; while at SS. Apostoli women congregated with tapers and lanterns in the hope of getting these kindled from the sacred flame, in order to wash their babies or cook their food in water heated with the fire. Meanwhile at seven o’clock the four oxen, which are kept in the Cascine all the year round and do no other work, had been harnessed to the car and had drawn it to the Piazza del Duomo, which was reached about nine. The oxen were then tethered by the Pisano doors of the Baptistery until needed again. After some haggling on the night before, I had secured a seat on a balcony facing Ghiberti’s first Baptistery doors, for eleven lire, and to this place I went at half-past ten. The piazza was then filling up, and at a quarter to eleven the trams running between the Cathedral and the Baptistery were stopped. In this space was the car. The present one, which dates from 1622, is more like a catafalque, and unless one sees it in motion, with the massive white oxen pulling it, one cannot believe in it as a vehicle at all. It is some thirty feet high, all black, with trumpery coloured paper festoons (concealing fireworks) upon it: trumpery as only the Roman Catholic Church can contrive. It stood in front of the Duomo some four yards from the Baptistery gates in a line with the Duomo’s central doors and the high altar. The doors were open, seats being placed on each side of the aisle the whole distance, and people making a solid avenue. Down this avenue were to come the clergy, and above it was to be stretched the line on which the dove was to travel from the altar, with the Pazzi fire, to ignite the car. 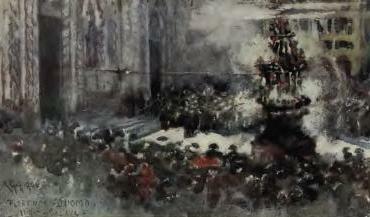 The space in front of the cathedral was cleared at about eleven, and cocked hats and red-striped trousers then became the most noticeable feature. The crowd was jolly and perhaps a little cynical; picture-postcard hawkers made most of the noise, and for some reason or other a forlorn peasant took this opportunity to offer for sale two equally forlorn hedgehogs. Each moment the concourse increased, for it is a fateful day and every one wants to know the issue: because, you see, if the dove runs true, lights the car, and returns, as a good dove should, to the altar ark, there will be a prosperous vintage and the pyrotechnist who controls the sacred bird’s movements will receive his wages. But if the dove runs defectively and there is any hitch, every one is dismayed, for the harvest will be bad and the pyrotechnist will receive nothing. Once he was imprisoned when things went astray and quite right too but the Florentines have grown more lenient. At about a quarter past eleven a procession of clergy emerged from the Duomo and crossed the space to the Baptistery. First, boys and youths in surplices. Then some scarlet hoods, waddling. Then purple hoods, and other colours, a little paunchier, waddling more, and lastly the archbishop, very sumptuous. All having disappeared into the Baptistery, through Ghiberti’s second gates, which I never saw opened before, the dove’s wire was stretched and fastened, a matter needing much care; and the crowds began to surge. The cocked hats and officers had the space all to themselves, with the car, the firemen, the pyrotechnist and the few privileged and very self-conscious civilians who were allowed inside. A curious incident, which many years ago might have been magnified into a portent, occurred while the ecclesiastics were in the Baptistery. Some one either bought and liberated several air balloons, or the string holding them was surreptitiously cut; but however it happened, the balls escaped and suddenly the crowd sent up a triumphant yell. At first I could see no reason for it, the Baptistery intervening, but then the balls swam into our ken and steadily floated over the cathedral out of sight amid tremendous satisfaction. And the portent? Well, as they moved against the blue sky they formed themselves into precisely the pattern of the palle on the Medici escutcheon. That is all. But think what that would have meant in the fifteenth century; the nods and frowns it would have occasioned; the dispersal of the Medici, the loss of power, and all the rest of it, that it would have presaged! At about twenty to twelve the ecclesiastics returned and were swallowed up by the Duomo, and then excitement began to be acute. The pyrotechnist was not free from it; he fussed about nervously; he tested everything again and again; he crawled under the car and out of it; he talked to officials; he inspected and re-inspected. 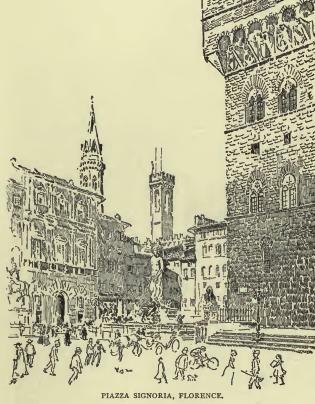 Photographers began to adjust their distances; the detached men in bowlers looked at their watches; the cocked hats drew nearer to the Duomo door. And then we heard a tearing noise. All eyes were turned to the great door, and out rushed the dove emitting a wake of sparks, entered the car and was out again on its homeward journey before one realized what had happened. And then the explosions began, and the bells silent since Thursday broke out. How many explosions there were I do not know; but they seemed to go on for ten minutes. This is a great moment not only for the spectator but for all Florence, for in myriad rooms mothers have been waiting, with their babies on their knees, for the first clang of the belfries, because if a child’s eyes are washed then it is unlikely ever to have weak sight, while if a baby takes its first steps to this accompaniment its legs will not be bowed. At the last explosion the pyrotechnist, now a calm man once more and a proud one, approached the car, the firemen poured water on smouldering parts, and the work of clearing up began. Then came the patient oxen, their horns and hooves gilt, and great masses of flowers on their heads, and red cloths with the lily of Florence on it over their backs much to be regretted since they obliterated their beautiful white skins and slowly the car lumbered off, and, the cocked hats relenting, the crowd poured after it and the Scoppio del Carro was over. The old Piazza, which, with the militant beauty of its great tower, is still, as ever, the centre of the city’s life, full of great and grim and splendid memories, offers to-day an almost unique specimen of an open-air museum, free for all who choose to come. There, ancient tapestries are yet hung on the Feast of San Giovanni; there, masterpieces of Florentine sculpture are ever before the people’s eyes. Men sleep through the hot hours in the shadow of the Perseus into which the truculent Benevenuto Cellini welded his enthusiasm, his genius, and all his household plate; and which, though it came into being amid such frenzied excitement, now stands ‘with brow and sword, supremely calm’. Street urchins clamber about the pedestal from which Judith gazes down with stern, set brows. Old crones gossip and gesticulate; wheedling pedlars entreat the unwary tourist to buy ‘Mosaic and postcard, veree cheap!’ under the great loggia where Dominicans and Franciscans gathered on that fatal day when Savonarola refused the trial by fire, and on that other day when Florence sent its prophet to his death. A modern medallion set in the pavement of this piazza marks the place of his martyrdom, and year by year on the 24 May, where the white smoke rolled and the red fire rose, the Florentines lay flowers in memory of him who, burnt to ashes and borne by the river to the sea, has not even a grave.